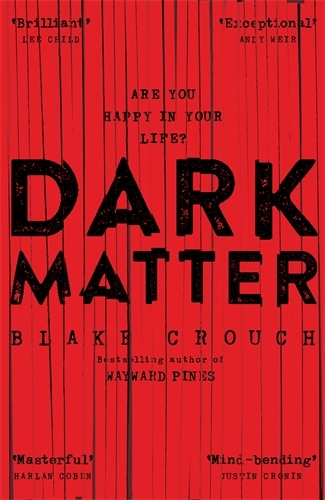 Blake Crouch, author of the Wayward Pines series, goes all Sliding Doors in his latest mind-bending thriller Dark Matter. Jason Dessen is a science teacher at a local college, he and his artist wife Daniella having given up promising careers to raise a child. Then everything goes a little haywire. Jason is kidnapped and knocked out. When he wakes up he is in a different reality, one in which he is a famous scientist who has been missing for fourteen months and Daniella is a famous artist who hardly remembers him. The question that plagues him is which reality it actually real. There have been plenty of books, TV series and movies that have dealt with the multiple world theory of quantum physics. That is, the idea that every time someone makes a decision two worlds branch off, one in which the decision was made and one in which it was not made. Many of these also involve time travel with the time travel event creating new multiverses. But there is no time travel in Dark Matter, time moves inexorably forward as Crouch’s characters explore various similar, utopian and dystopian versions of present day Chicago. And about two thirds of the way through Dark Matter takes one almighty twist which sets up a weird but tense finale. Dark Matter seems to have an underlying message but it is difficult to work out what it is. Is it: be happy with who you are and what you have because you may well have been unhappier with the alternative? Or is it: don’t sweat what you choose because somewhere in the multiverse you have made the other choice? Or is it: be careful what you wish for as it might just come true? Or perhaps it is a nurture v nature argument as the married with kids version of Jason seems to be much less ruthless than the single-minded scientist version. But putting all of the metaphysical and existential chicanery aside, once Jason is abducted Dark Matter is pretty much non-stop action. Crouch keeps the tension high with short sentences in short paragraphs, well written action scenes and an almost impossible quest where the level of difficulty keeps growing. So the best advice is accept the premise, go with the flow and the pages will almost turn themselves.